Mike was Daria's driving instructor and oversaw her tests. 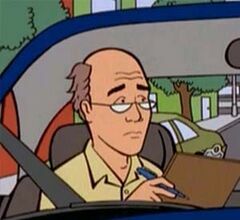 He was a soft-spoken man with a calm view on Daria's ability to parallel park... and when she finally did it and could pass her test, ecstatically cheered "YES! YES! AT LAST!". According to her, she'd been training with Mike a lot.